For serious PC builders, speed is the name of the game. Too often, storage becomes a bottleneck that holds back even the beefiest CPU. Even with the advent of SSDs, leveraging a redundant array of independent disks (RAID) can drastically reduce boot and loading times. RAID 0 is the easiest way to get more speed out of two or more drives, and lets you use a pretty cool acronym to boot. In our test rig, we used a pair of Samsung 840EVOs with the latest firmware. RAID has several “levels” that use drives in different ways. Level 0 (RAID 0) spreads or “stripes” data between two or more drives. The problem with striping data across drives is that when things go wrong, they go really wrong: If a single hard drive in a RAID 0 array fails and cannot be recovered, the entire RAID array is lost. On the plus side, RAID 0 combines the drives into a single larger logical drive with a capacity that is the sum of all the drives in the array. We found in our test rig that write cache stacked as well, which resulted in faster writing for large files. The data stored on the drives are read or written simultaneously, resulting in greatly reduced access times. There are three ways to implement RAID: hardware, software, and FakeRAID. Hardware RAID is faster, but it’s also more expensive due to the need for specialized hardware. Software and FakeRAID use the CPU in lieu of a dedicated RAID chip. Creating a software RAID array in operating system software is the easiest way to go. Windows 8 comes with everything you need to use software RAID, while the Linux package “ mdadm ” is listed in most standard repositories. The problem with software RAID is that it only exists in the OS it was created in. Linux can’t see a RAID array created in Windows and vice versa. If you’re dual booting both Linux and Windows and need access to the array from both operating systems, use FakeRAID. Otherwise, stick to software. To ensure the best RAID performance, use identical drives with the same firmware. Mixing drive makes and models may work, but will result in faster drives being slowed down to match the slowest drive in the array. 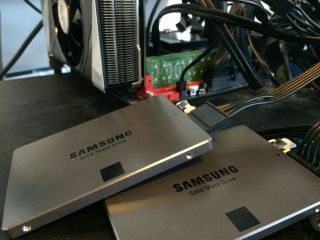 Don’t mix SSDs and mechanical drives in a RAID array; the SSD is faster on its own. RAID 0 doesn’t protect you from drive failure, so use new drives whenever possible. When connecting your drives, make sure they’re all using the same SATA version as well. Before a drive can be used in a RAID array, it must be clear of filesystems and partitions. If you’re using old drives, make sure you get everything of value off of them first. You can remove any partitions with Disk Management on Windows or “gparted” on Linux. If you’re using FakeRAID, the motherboard’s RAID utility should warn you before it wipes partition tables and the filesystems on them. In your operating system, you’ll need to have elevated permissions to create a RAID array. For Windows, you’ll need to be an Administrator. In Linux, you’ll need either the root password or sudo access. If you want to use FakeRAID, make sure your motherboard supports it. Be warned though: Installing an OS on top of a RAID 0 array can be really risky if your system data is critical. Creating a software RAID 0 array on Windows is really easy, and relatively painless. The thing is, Microsoft doesn’t call it RAID in Windows 8, opting for “storage spaces” and “storage pools” instead. Hit Win+S and search for “storage spaces” and open the utility. Next, click Create a new pool and storage space . You’ll be prompted for administrator access. Click Yes to continue. Windows 8's built-in RAID software goes by the name "Storage Spaces." To create a storage pool in Windows 8, the disks need to be unformatted. Next, give the pool a name and drive letter. The name will appear as the drive label. Select NTFS as the filesystem. For Resiliency type, select Simple (no resiliency) . This is the equivalent to RAID0. When you’re ready, click Create storage space to create the array. While a simple storage space technically only requires one hard disk, you need at least two for it to be a true RAID setup. When you're all done, you'll be able to manage your storage spaces, check capacity, and monitor usage. See? Told you it was easy. Next up, we're going to cover creating RAID 0 arrays in Linux and in FakeRAID .